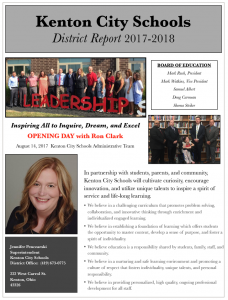 The District Report for 2017-2018 is now available for viewing. The report includes district goals, fiscal responsibilities, staffing, departmental reports, and much more. In partnership with students, parents, and community, Kenton City Schools will cultivate curiosity, encourage innovation, and utilize unique talents to inspire a spirit of service and life-long learning. We believe in a challenging curriculum that promotes problem solving, collaboration, and innovative thinking through enrichment and individualized engaged learning. We believe in establishing a foundation of learning which offers students the opportunity to master content, develop a sense of purpose, and foster a spirit of individuality. We believe education is a responsibility shared by students, family, staff, and community. We believe in a nurturing and safe learning environment and promoting a culture of respect that fosters individuality, unique talents, and personal responsibility. We believe in providing personalized, high quality, ongoing professional development for all staff.